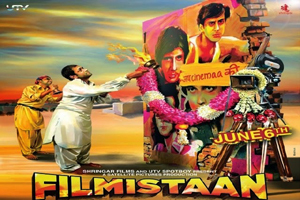 Filmistaan is a 2014 Bollywood comedy film written and directed by Nitin Kakkar and produced by Shyam Shroff, Balkrishna Shroff. The film stars Sharib Hashmi, Innamulhaq, Kumud Mishra, Gopal Datt in lead roles, while Saroj Sharma, Sanjay Mehta 1, Ravi Bhushan, Waseem Khan, Tushar Jha, Manoj Bakshi, Sagnik Chakrabarty, Habib Aazmi, Kavita Thapliyal, Punit Nijhawan, Neela Gokhale plays a supporting roles. The soundtrack of the film is composed by Arijit Dutta, while lyrics were penned by Ravinder Randhawa. Here is the link of all the songs lyrics and videos of Filmistaan.